There's the Clarisonic, Olay Professional Pro X Advanced, Philips VisaPure Facial Cleansing Brush and the one I'm reviewing today the No7 Cleansing Brush. The prices for these facial brushes range from £24 - £150!! To me that's a varied price tag for something that is cleaning our face. Granted we are told that we should invest in our skin and I do believe we should do so, within our means. I decided to try the No7 brush because I've heard about brushes giving some people that purging I've read a few articles that that some skin specialists say purging is a myth while I've read another that gives a truth & facts knowing the difference between your skin purging or having negative reactions. I think as you work with your skin and find products you find work for you, you begin to know the difference in your skin, something I've discovered quite a lot as of late. I started using new products on the market that were aimed at acne, I suffer from mild outbreaks and when I broke out using these products, I broke out so bad, spots underneath the skin, so sore - I've never encountered spots like it before. I knew it wasn't working for me. Immediately I thought back to my skincare routine of last year, my skin was in such a better state last year so I went back to my skin wash routine but instead of using my Body Shop facial brush I introduced a electric brush. 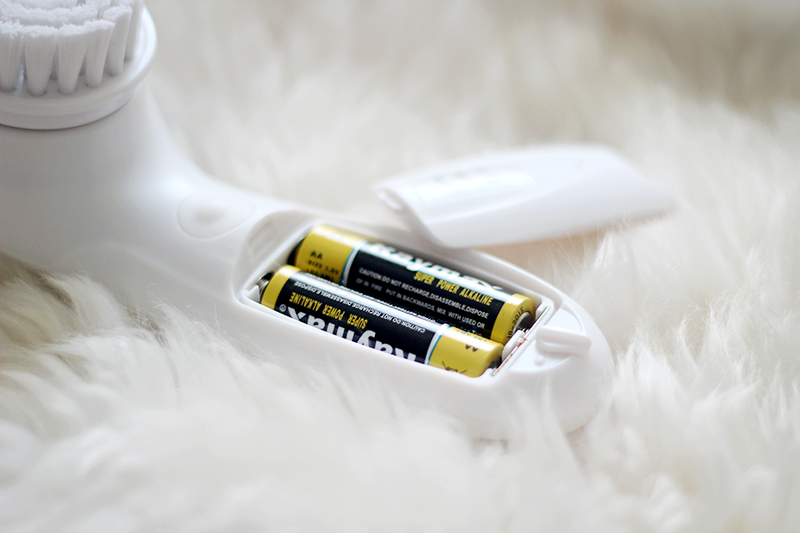 Once purchased you receive 2x AA batteries and a brush head already attached to the unit. The brush head works by rotating. Replacement heads are £8.00 for two in a pack, recommended to be changed every 3-4 months, I think it's great that you get two units in the packet meaning you purchase less yearly. I would judge mine by the third month on the bristles but will probably purchase a new packet in my third month for hygienic purposes. This has two speeds, you can see the rubber button above the battery insert, this has two speeds. Pressing once you get a speed that will give you a gentle clean, press it twice for a more deeper cleanse, press once more to switch it off. Don't press too hard onto your skin, I did read it will automatically switch off if the pressure is too harsh, so that is a good thing. I've yet to experience that may try it on my arm to see if it's true. Normally I'm so against things that run on batteries as I just hate purchasing batteries but I see that it's great to take away anywhere...let's say camping lol due to the fact it's battery powered. It has a little latch that's easy to push aside and open. It doesn't say if this is water resistant or waterproof but I will guess it is water resistant due to it being battery operated, so I wouldn't suggest taking this into the shower or accidentally dropping it in your bath. I may see a problem with it being battery operated that with the repetitive of opening the latch the seal may start to wear, like anything you have with batteries but I don't see that if so occurring for quite a while. I use this for roughly under a minute with my Manuka Doctor Bee Venom Foam Cleanser (you can read my review here) & I always wear a hairband because of my hairline I would hate to feel my hair catch while this is rotating. There has been no purging, the only break-outs I got were hormonal, Within the first few days of using this my skin was a lot more drier, I suffer from combination skin and managing to control the oil more beforehand, the skin dried out. I reduced use from every other day to 3x a week for under a minute. Being I don't wear make-up daily but when I do, I especially like to use this to bring up anything extra that's lurking. There's a few things I would change personally, but then I could see the cost wouldn't be the same, I'd love a timer, I could see some getting carried away and brushing every layer off. I would say an on - off button but it's quite handy having the one button during use, a stand, I would say for it to be able to use batteries & a charger and maybe different types of brushes .... umm yeah but for the most part, I'm super happy with this purchase. Definitely a thumbs up from me. 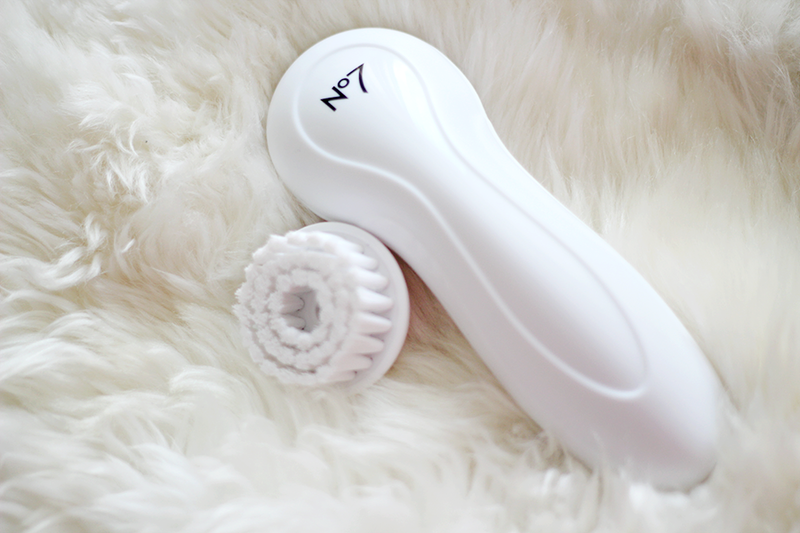 Do you use an electric cleansing brush? What are your thoughts on them? I was reading a review on this a couple of days ago where the reviewer found it a little scratchy but then she did have sensitive skin. I'm oily/combination typed too! So it is probably best suited to our skin type. 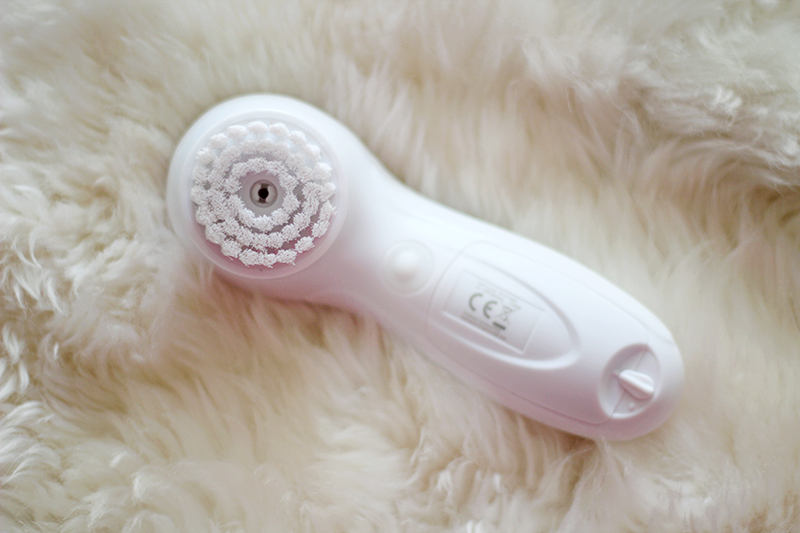 Always wanted to try the Clarisonic but there's SO many mixed reviews! Ouch, luckily I didn't find it scratchy (leather skin lol) a slight adjustment as I'm not use to anything electrical cleaning my face but that's why I think having different heads would be ideal for varied consumers. I have seen other reviews for this where they complained the brush was not soft enough to use on your face. I have never seen this myself or even used it so I can comment. I do think its a great price and usually No 7 products are very good. I have an Olay one from the USA that I really like, its a battery operated one too, which I think is good, I dont have to worry about forgetting my charger if I take it away anywhere. I would like to try this brush.